The global sealant market is expected to register a CAGR of 6.42% (in terms of revenue) during the forecast period. The building & construction industry was the largest market in 2017, accounting for around 49% of the global market, followed by the transportation and electronics industries. Sealants, owing to their characteristics and physical properties (such as, good cohesion, adhesion, elasticity, high cohesive strength, flexibility, high elastic modulus of substrate, resistance to thermal expansion, environmental resistance to UV light, corrosion, salt water, rain, and other weathering conditions) have extensive use in the construction industry. Sealants are mainly used to seal the joints and gaps between substrates; hence, they are critical components of the construction industry. The chief purpose of sealants is to avoid air, water, and other elements from exiting or entering the structure. The pace of growth of the global construction industry stabilized in 2016. However, it is expected to increase during the coming years in regions like the Middle East and Asia-Pacific. Construction is likely to be one of the most dynamic industrial sectors in the next 15 years and is utterly crucial to the evolution of prosperous societies around the world. The volume of construction output will grow by 85%, to USD 15.5 trillion, globally, by 2030, with three countries, China, the United States, and India, leading the way and accounting for 57% of all global growth. Longer-term demand is expected to be evinced across all regions, but with particular strength in South America and Asia, where major construction and infrastructure improvement projects are planned. In Europe, the construction industry is stabilized; however, it is not expected to continue to decelerate. Silicones are versatile polymers. Their chemical properties are such, that they offer excellent bond with enormous power. These are designed to provide permanent and temporary bonding to the surfaces, such as glass, metal and stone. The nature of bonding depends on the application for which it is used. These sealants effectively work under harsh environments of temperature range, abrasion and climatic change. Hence, they are water, chemical and temperature resistant, flexible and they deliver outstanding performance. Furthermore, these sealants are transparent, permeable to gas and water vapor, and they provide thermal and electrical conductivity. Silicone sealants are used in numerous applications due to excellent properties that they offer. The major end-user industries for these sealants are electronics & electrical, automotive, aerospace, and building & construction. The demand for these sealants is expected to increase in the electronics and automotive sector due to its property to withstand extreme temperatures. Furthermore, in the building & construction sector, its usage is increasing as silicone sealants can be used even in extreme weather conditions. India is a growing economy and holds great potential for future market opportunities. Despite the unfavorable global economic issues, robust urban consumption and increase in public investment have guided growth in the Indian economy. Industrial production, as well as the automotive, electrical & electronics, and manufacturing sectors, has seen increased growth, with commercial and government investments, as well as FDI involvement, driving the market for sealants in India. The major manufacturers of sealant in India are Arkema (Bostik), Ashland Inc., Henkel Ag & Co. KGaA, and 3M, among others. End-user industries, such as, the automotive, construction, and manufacturing industries, as well as the packaging industry, have seen increased growth with private and government investments, as well as FDI involvement, boosting the market for sealants at a larger scale in India. The construction industry in India is growing at a high rate, with numerous urbanization projects and new construction activities, such as, bridges, dams, roads, railways (metro rails), urban infrastructures, buildings, and others. The 100% FDI in the construction industry has also helped the industry grow, which is expected to grow at a high rate during the forecast period. This growth is expected to help the sealants market grow at a high rate during the forecast period. December 2017: Henkel acquired Darex Packaging Technologies business, supplier of high-performance sealants and coatings for USD 1.05 billion. Major Key Players: Henkel, DowDupont, Illinois Tool Works Inc. and H.B. Fuller. 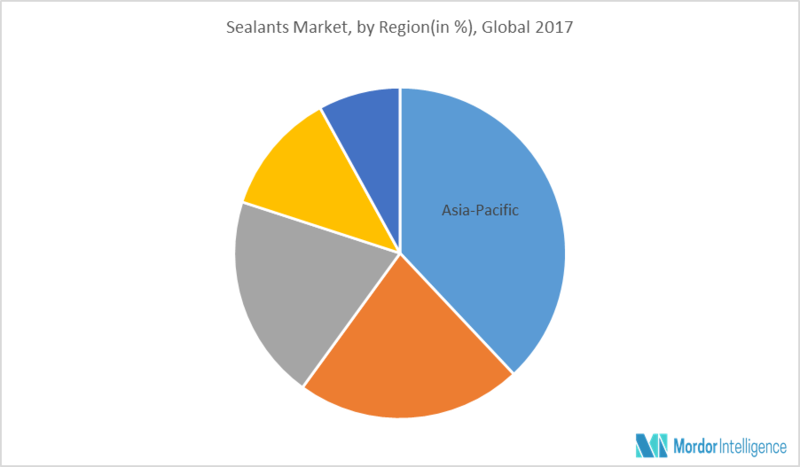 Why Purchase Our Global Sealants Market Report?